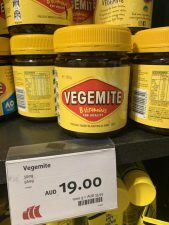 The photo shows a jar of Vegemite on sale at Sydney Airport, at an exorbitant price. The jar in the picture was labeled with a $19 price tag. For comparison, the same sized jar is priced at $8 at Woolworths.